Thirty-four police officers and 36 institutions received commendations from the minister of health and welfare for their contributions to suicide prevention. Inspector Ham Myung-ho, who is part of the missing person investigation team at Seoul Gwanak Police, has looked into some 700 cases of suicide attempt calls and reports since 2011. 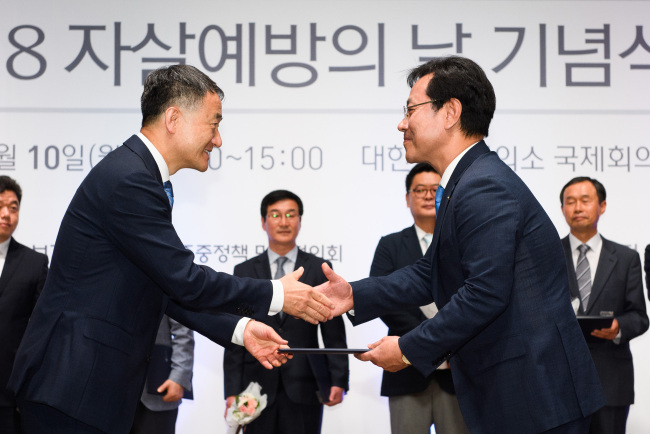 Minister of Health and Welfare Park Neung-hoo said in a speech at the event that the ministry included suicide prevention as one of the 100 governance tasks of the current administration, and created a department dedicated to solving the social problem. In 2016, 25.6 per 100,000 people took their own lives in Korea, which has the second-highest suicide rate among member countries of the Organization for Economic Cooperation and development. The No. 1 cause of death among people between 10 to 39 years old was suicide, according to Statistics Korea.